Constellation's AstroChart For Business Trends, Q4 2016 | Constellation Research Inc.
Constellation’s AstroChartTM for Business Trends provides market leaders and fast followers a visual guide to business trends and their adoption. The vertical access rates adoption from mainstream to early adopters to bleeding edge. The horizontal access estimates the impact on an organization’s business model. from incremental to disruptive to logarithmic. The intent of an AstroChartTM is to move beyond both the hype and constraints of a 2 x 2 grid. From over one hundred interviews with boards and CXO’s, Constellation has brought together an AstroChart of how various business trends play out. These trends will be updated every 180 days or sooner but reflect what’s placed into our Futurist Framework and PESTEL model as well as various inquiries and primary research. Bleeding edge – Logarithmic. Brand new startups and innovation teams are building to digital ecosystem networks and situational awareness. Bleeding edge – Disruptive. Mass personalization, robotic process automation, and sales by design drive this category. Bleeding edge – Incremental. Digital ethics plays a role among early pioneers. Early adopter – Logarithmic. Digital transformation remains high on this list in the search for growth and the avoidance of digital disruption. Early adopter – Disruptive. The majority of trends currently are in the early adopter category and include sharing economy, digital artisans, P2p networks, design thinking, chief digital officers, gig economy, and inclusion programs. Early adopter – Incremental. Customer success management, job sharing, gamification, co-working spaces, demand driven networks, and gamification show incremental improvement as they fall from being disruptive to incremental. Mainstream – Logarithmic. There are no topic areas here but total quality management from the 1980’s and Six Sigma from the 1990’s would be an example. Mainstream – Disruptive. Innovation centers and agile dev ops are now mainstream adoption and disruptive. Mainstream – Incremental. CSR programs and business process outsourcing remain mainstays and mainstream incremental. Logarithmic – bleeding edge bets require a very informed or founder driven board. 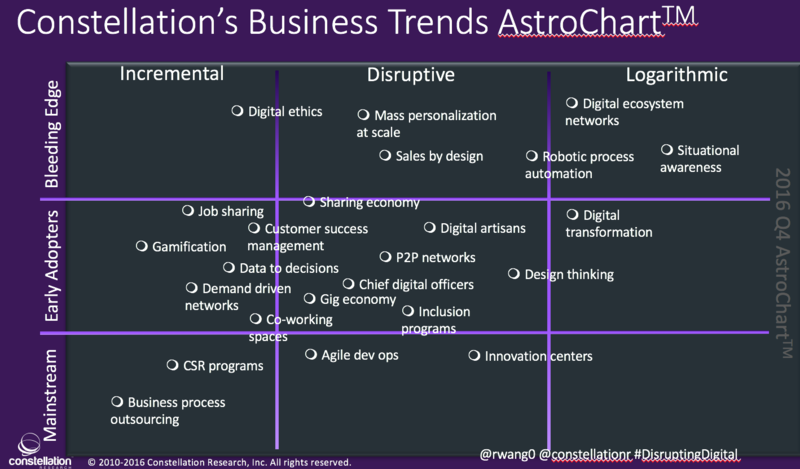 Ready to take advantage of the Constellation’s AstroChartTM for business trends? How have you built out your strategic investment map? Learn how non-digital organizations can apply a business trends roadmap and the PESTEL futurist framework to disrupt digital businesses in the best-selling Harvard Business Review Press book Disrupting Digital.